You may already know that I was an early pioneer in getting my breast cancer treated with a novel, non-morbid, breast-conserving treatment called cryo-ablation. That was 10 years ago. Now we’re trying to spread the word. We’re hoping the efforts this fundraiser supports will go a long way towards acting as a catalyst for very positive change. Even a very small contribution helps, especially if you share this message with your friends. 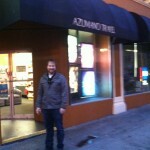 Louie and I went down to Azamano Travel to book our flights to Fuda Hospital today!! Even though we haven’t made our fundraising goal yet, we’ve gotten enough to give us confidence it’s going to work and we didn’t want to have to pay higher fees for booking any later.